Jakarta Transportation Dept. (Dishub) invites stakeholders from Transportation Ministry, Jakarta Transportation Council (DKTJ), PT. MRT Jakarta, Indonesian Ombudsman Jakarta Representative, Public Transportation User Community, Pedestrian Coalition, Indonesian Blind Union (Pertuni), and Indonesia Transportation Society to discuss about Light Rail Transit (LRT) Jakarta implementation.
" It is the continuation from the previous FGD since LRT Jakarta is targeted to operate in February 2019"
Jakarta Dishub Action (Plt) Head, Sigit Wijatmoko conveyed, it will be done in Forum Group Discussion (FGD) with topics about infrastructure completion, operational and business plans, human resources preparedness, administration, testing, certification, general services standard, tariff formulation, and subsidy. 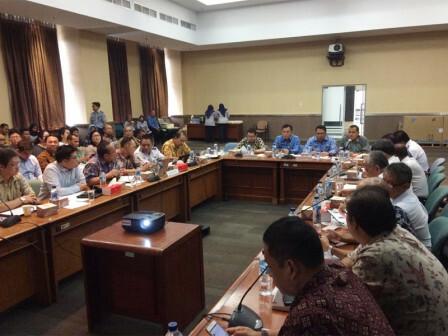 "It is the continuation from the previous FGD since LRT Jakarta is targeted to operate in February 2019," he said at Kompleks Dinas Teknis, Jati Baru, Tanah Abang, Central Jakarta, Tuesday (11/27). He explained, in this FGD, they also discuss about LRT integration system with other road and rail-based mass transportation. Thus LRT can be a unit that gives all transportation services that citizens demand. "LRT should be able to serve all kinds of communities. Thus LRT will not only become a new transportation, but also able to bring integration and continuation," he explained. He conveyed, socialization to public regarding LRT Corridor 1 Kelapa Gading-Rawamangun route operational also becomes an important part. Because advanced transportation mode integration is very absolute and becomes a challenge in the future. "As public transportation service provider, integration with other mass transportation will be a successful implementation," he expressed.